Hackescher Hof also known as Die Hackeschen Hofe is known as the connecting point of Berliners and the tourists that frequent the city often. Although, this place was destroyed after the second world war, today it is a contrast of the old artistic Berlin as well as today’s lively Berlin. In most areas of the city, you would find a very prominent contrast between the modernity as well as the historical aspect of the city. Hackescher Hof constitutes of various courtyards out of which one is a group of high end architectural firms, one is a line of shops, bars and cafes and the main one is full of architecture of the Art Nouveau style. Do not enter the buildings of offices without prior permission. Avoid going alone at night. Depends on what you eat and the rest of the activities. Please find out the timings for any particular place in the area that you want to visit. How popular is Hackescher Hof? 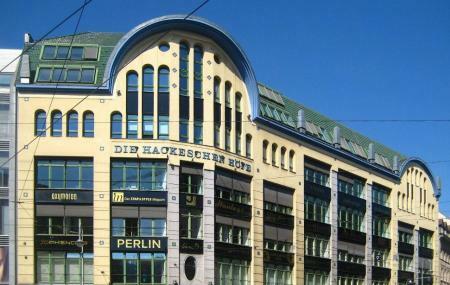 People normally club together Madame Tussauds Berlin and Kurfurstendamm while planning their visit to Hackescher Hof. Pretty decent place. We were just in the cafe kn the front, not in the restaurant in the back. Nice cup of coffee but nothing super special. If you are in the area and want to stop for a break this is a nice place, if you want special coffee then look for one of the smaller coffee shops. The cake may look nice but was way to sugary for my taste. Decent place for food and a drink. The price is reasonable. Enjoyed the night there but not top of the roof enjoyment. Very nice place. The cappuccino and the hot lemon was very good. It was very crowded and loud but the staff was nice and they brought our order very fast. It looked from the outside very expensive but the prices are normal. The cheesecake was too sweet for our taste but very creamy. Busy place, yet easy to get a table and enjoy a break from the bustle and bustle. Service is polite and helpful. Walk in, seat yourself and enjoy the atmosphere in the timely decor among updated establishments nearby. We had a meal around 14:30. The service was very good, the dishes are good. You can choose between a daily lunch fish or meat for a reasonable price and besides you can choose from the menu. The place is divided in two : a restaurant part and a cafe part. Both parts a large. I enjoyed it.